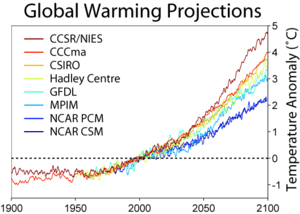 The vast majority of na-sayers of global warming are political conservatives, typically Republicans, who don’t want to believe that global warming is a fact and/or that it is primarily caused by greenhouse gases produced from man. Most do not have a scientific background nor have a rudimentary understanding of climate science and global warming mechanisms. As for most things there are a very small number of exceptions. However for those conservatives who are somewhat knowledgeable about it just about all of them believe in out dated theories that support their arguments or believe that it is a natural cycle not caused by man. But the vast majority of current data strongly points to compelling global warming trends that can only be explained by man made sources. The vast majority of global warming believers come from a very broad rang of people ranging from conservatives through liberals. 97% of all climate scientist who have dedicated their lives to the study and understanding of climate and climate change are among the believers. This is reflected by just about every major university in America because the preponderance of current data supports this argument. I have written quite a bit about this subject and have a somewhat decent layman’s understanding about global warming and can hold my own in a discussion. I doubt that na-sayers can come close to claim that more than 50% of climate scientist do not believe in global warming caused by man. At most there are far less than 5%. Any reasonable man would logically side with the 97% ya-sayers as opposed to the 3% na-sayers. Many of the ya-sayers were once na-sayers who finally realized what the sheer weight of current data is pointing to. So what accounts for the power of na-sayers in their denial about global warming? Conservatives by definition resist change to their long held beliefs. So when told that climate is going to dramatically change they refuse to believe it. They were the passengers on the Titanic who did not believe that the ship could sink until it listed so much that the furniture they sat on started sliding. Reasoning with them falls on deaf ears no matter how compelling your arguments. They cling to what other conservative they consider authoritative figures such as columnist, radio talk host, and bloggers say and use them as supporting authorities. They cling to what some climate scientists said years ago and ignore current more up to date scientific studies. They believe in what they want to believe. The problem is that many of them are in positions of great influence and power in government and industry. Global warming is not good for big business since most industries use enormous amounts of green house based energy or are in the business of providing these fuels. Thus there are a lot of special interest that would rather ignore this issue rather than address it and upset their business model apple carts. There is big money going into influencing government to stay out of the climate change initiatives and laws. Thus due to the short term interests of mainstream industries to maintain the status quo in order to keep shareholders happy rather than spend money and resources on re-tooling and address the long term and devastating consequences of global warming they are sparing no expense to influence the public and government that there is no basis for the claims of the vast majority of climate scientists that global warming is real, man caused, and imminent. Thus the na-sayers of global warming have the endless resources and backing of mainstream industries to defy the truth of science by using political influences to support or defeat laws whichever favors their cause. The carbon based energy producing industries and many technologies dependent upon carbon based fuels as well as infrastructure supporting these technologies constitute a major portion of our entire economy. So one can see that the na-sayers have much power on their side in spite of being on nonexistent scientific ground. The overwhelming power of the church in the middle ages also defied the truth of Galileo’s science that the earth was round and not the center of the universe. But in the end Galileo and the truth won out. The difference is that if climate scientist are right and continue to be ignored by the power of na-sayers, global warming will continue unabated and eventually destroy the industries, na-sayers, and everyone else. Then there is a huge group of what I call Apathetic people who believe that global warming is real and man-made but feel their voice doesn’t count and will be too slow to affect them. They feel that their voice is too small to make a difference to big government. What they fail to recognize is that big government does listen if there are enough little voices shouting at them. A single voice in a large crowd of people adds to the volume of voices expressing themselves similarly on a subject. Politicians listen to what many constituents say because they want to get reelected. If they hear only one voice it doesn’t count. But if they hear thousands of voices on a subject it does make a huge difference. So it is extremely important that these people understand that their cumulative voices count. They need to speak out and write their representatives in government. The exact wording doesn’t mean that much but clearly saying that they are for or against something does get added to the data accumulated by representatives. You can find your representative’s website by searching for their name on the web. So I say to the Apathetic add your voice to those already expressing themselves and the cacophony will crescendo into a strong and clear message to your political leaders. This is how America’s democracy (republic) works and what I am doing! This entry was posted in Climate Change, Environment and tagged Climate, Climate Change, climate scientist, conservatives, Global Warming. Bookmark the permalink. At every knew understanding or discovery, there have always been a small percentage of people who lag behind. This is true in everything from Civil Rights issues to science. And yes, it’s difficult to relate to these folks. You are obviously correct. The data supports your argument. Thank you.